As I write this, many of the 32 NFL clubs are finishing up Pro Day visits as well as some private workouts. In another week or so, clubs will being the process of putting their final boards together in pre-draft meetings, making final preparations for the 2018 NFL Draft. What many people feel goes on in draft rooms and what actually goes on are two different things. There are a few misconceptions that I will talk about today. Right off the bat, you may have noticed that I didn’t use the term “War Room”. I refuse to use that phrase as it relates to the NFL draft. Fourteen years ago, former Arizona Cardinals safety Pat Tillman lost his life while serving for the US Army Special Forces in Afghanistan. Tillman played his college football at Arizona State and one of his teammates was Ted Monago, who later became a scout with the Bears and is now the Assistant Director of College Scouting for the L.A. Rams. After college, while Pat was playing in the NFL, Ted was climbing the coaching ladder. Ted and Pat remained close friends and regularly stayed in touch. Ted left coaching in 2001 to enter scouting and I hired him in June of that year. In April 2004 during out pre-draft meetings, Robyn Wilkey (originally from Grand Island) who was general manager Jerry Angelo’s assistant, came into our meeting room and told Ted he had an important phone call from his mother. Ted went out to take the call and a few minutes later came back into the meeting room with tears in his eyes. He was pale and could hardly talk so I asked him what was wrong. He could barely reply and just said “Pat’s dead”. At that moment I didn’t know who he was referring to so I asked who Pat was? He said his mom just told him that news broke about Pat Tillman being killed in action. Needless to say, we ended out meetings that very minute and adjourned for the day. A short time later, I sent an email to all football operations staff that the draft room was no longer to be referred to as the war room. We are involved in the game of football, not in fighting a war. From that day on, the Chicago Bears have always referred to that room as the “Draft Room”. In talking to draft fans, I get the impression that many of them feel that many decisions that are made during a draft are last minute. 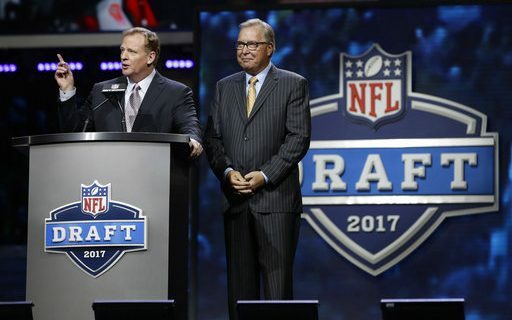 While that can be true when deciding on who to select between two players, most teams have a draft plan that was set in place during the meetings leading up to the draft. When the idea of trading up or down comes into play, it was already thoroughly discussed during the meetings. If a team is after one particular player and they feel they have to move up in a round to get that player then the cost of moving up is discussed. When I started my career in scouting in the early 1980’s there was no such thing as a trade chart. You would make or receive a call and terms were discussed. If you felt the terms were fair, the trade was made. That changed when Jimmy Johnson was coach of the Dallas Cowboys. Johnson didn’t like that there was no formal formula for making draft day trades. Because of that, he devised a chart that gave every pick in the draft a number value. If a team wanted to trade up, it had to have the picks that equaled the point value of the higher pick. While every team in the league now has a value chart, not every chart is the same but they are similar. They have changed considerably from the original charts because with the latest CBA, money values have changed. Clubs don’t strictly adhere to the value chart. It is used more so as a guide. The real value of picks, especially at the top of the draft, can change from year to year depending on who is in that draft. This year, the cost to move up to draft a quarterback has already been established when the New York Jets traded with the Indianapolis Colts. The Jets paid a premium to move from number six to number three in the first round. Any other trades made this year to get into the top five will be made with the Jets/Colts trade in mind. That said, when a club is thinking about making a trade, what it wants to do and what it is able to do are sometimes two different things. Regardless, what they are able to do is determined in the days leading up to the draft. To move up, especially in the first round, a club needs plenty of ammunition. If a team is happy drafting any of three or four different players that are rated highly on their board, it can always make the case to trade down. By moving down, the club obviously acquires more draft picks. Teams that are short on picks in a given year, are usually receptive to moving down. Making the trade is a highly-vetted process. What are the advantages of moving up? What are the advantages of moving down? Can a team still get a coveted player or players by moving down? If you can’t answer yes to the last question, don’t make the trade! Who makes the decision on who to draft? By league rule, there is one person and one person only who has final say in draft day selections. In most cases that is the general manager, but there are clubs where the head coach has final say on who gets drafted. In my 26 years with the Giants and Bears, while the general manager always had the final say, it was always a collective decision in which the scouts, the GM, head coach and scouting director were all in agreement or at least had a say in the decision. There was never a pick made that wasn’t discussed thoroughly. Going into a draft, many teams have certain players that they want to target in each round. If everything goes as planned it becomes very easy to make those selections come draft day. If a club has its heart set on one particular player, chances are they will be heartbroken. While that certain player may be there sometimes, he won’t be there all the time. That’s why a club has to have a list of several names for each round. They prioritize the list and if the top player isn’t there, then go to number two. You have to have a discussion to get the players ranked properly. Anyone who saw the player and wrote a report was allowed to enter in the discussion. Not only was the player’s talent talked about, but so too was his character and his fit within the scheme. If we reached a consensus that he was a player we wanted, he was put on the list. If we couldn’t reach a consensus, that player was eliminated. That said, the room where meetings and the draft were held wasn’t exactly a democracy. The GM and head coach obviously had more weight with their votes. If a final decision had to be made, the person in charge of the 53 man roster had final say. Do clubs take the “best player available”? While drafting the best player available sounds good, it seldom really happens. Most clubs take the best available player at a need position. Teams seldom go into a draft with just one need. They have several, but some needs are more important than others. During the ranking process prospects at positions of need always seem to find their way to the top of lists. That’s not to say that a team will turn down a player at a non-need position. If that player is clearly better than the other players left on the board, consideration has to be given to drafting that player. The other thing that comes into consideration when a player like that is available is the discussion to trade down. Passing on a highly rated player can come back to haunt you but if you trade down and gets extra picks that can offset passing. The whole idea is to make the club stronger. When watching the draft, the television analysts will often say after a team picks that they had another player at the same position ranked higher. That may be true because not only are analyst’s boards different from team boards but also no two teams have the same board. Each team rates prospects based on a player profile for each position. They want a certain type of player for each and every positon on the team. For instance, if a team plays a four man defensive front, they have each of the two end positions defined as well as the two tackle positions. When scouts are on the road, they look closely at players that fit the profile wanted. Because of that, scouts from team A will look at players much differently than scouts form team B. What the Bears are looking for this year in defensive linemen is entirely different from what they have looked for the last 10 or 11 years because the defensive scheme is so much different. Players that were fits in a 1-gap, 4-3 scheme seldom are fits to play in a 2-gap 3-4 scheme. The same can be said about the linebackers. They now are looking for players with different traits than they were before. The television analysts often try to be right at what area of the draft a player will be drafted. They really aren’t looking at team fits and they seldom know exactly what each team is looking for. So when they criticize a pick, they don’t really know what they are talking about. The other thing they don’t know is the results of medical exams unless they were publically leaked. On draft day, a player usually drops for one of two reasons, a poor medical or poor character. While teams boards won’t differ that much as to who are the top 50 players in a draft, once you get past the second round the difference can be huge. It’s not odd to see a player who one club may rate as a fifth round pick get selected in the third round by another club. That’s not to say one club is right and the other is wrong, it’s just a difference in opinion in how they evaluated the player. Scheme fit also enters into that equation. Don’t look for a 4-3 team to draft a 6’3 – 340 pound nose tackle, that player can’t play in many 4-3 schemes. At the same time, don’t look for a 3-4 team to draft a 275 pound defensive tackle. Greg breaks down what it will cost for the Bills to move up in the Draft. Greg breaks down which QB the Bills should draft.